The first part of this article you will find here. To follow all links, you have to log in to mySea. An alternative to the large bay of Ag. Nikolaos is Otzias Bay, slightly further north. The long bay is always a little rough when there is a north wind, and there is an obvious swell in the bay. When there are NE winds, the bay is untenable and visitors need to look for another option as soon as possible. The crescent-shaped bay can accommodate a whole range of yachts, which anchor here on a sandy seabed in front of the cordoned-off swimming area. If visitors do not feel like cooking, they will find two taverns on shore. The “Annas” tavern is open all year round and has a glorious view of the bay from its upper terrace. In the north-east, Ormos Kalydonychi cuts into the steep rocky shore of Kea. The bay is also known as Spathi, as that is the name of the nearby cape. The bay provides shelter from the Meltemi even though there is a slight swell and gusts may blow through the river valley. Yachts anchor swinging freely on the hook without a shore line at a water depth of 3-8 m above a sandy seabed with good holding. On shore, a lovely sandy beach stretches out and it is often empty, behind that a few scattered holiday homes and fields. A small tavern is open in the summer. The bay is isolated and can only be reached by boat. There is a footpath into the valley but it is extremely winding and a struggle to walk on. 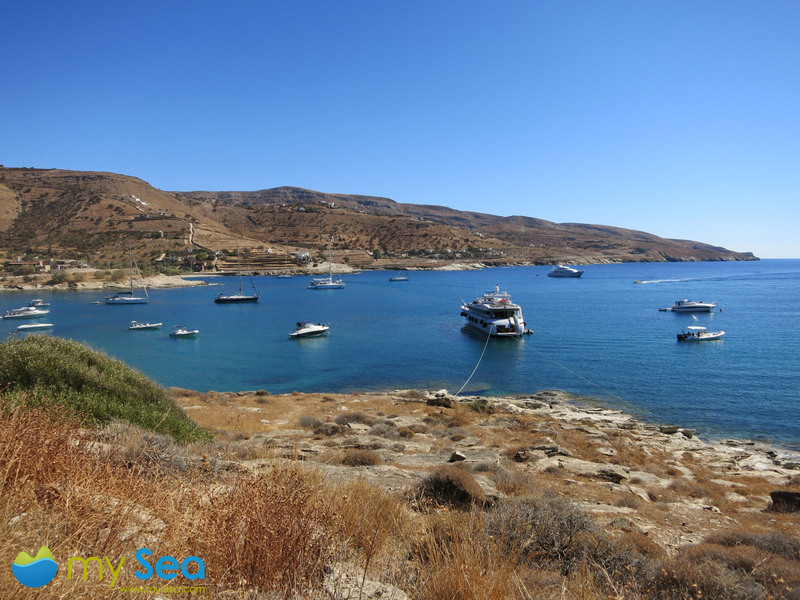 There are a number of small bays with crystal-clear water, some with lovely sandy beaches, along the steep coast towards the south. But the bays are all quite deep and do not provide enough protection. Visitors hoping to enjoy some peace and quiet should certainly explore the small bays when the weather is calm. Ormos Polais lies in the south-east of Kea. The landscape of the bay is very beautiful, but it does not provide enough protection when there is a north wind, therefore it is only suitable for a stopover when the weather is calm. There is a visible rock in the middle of the bay. The shallow reef between the rock and the beach divides the bay more or less into two sections. There is a beach, roughly 200 m long, at the waterfront as well as two chapels. 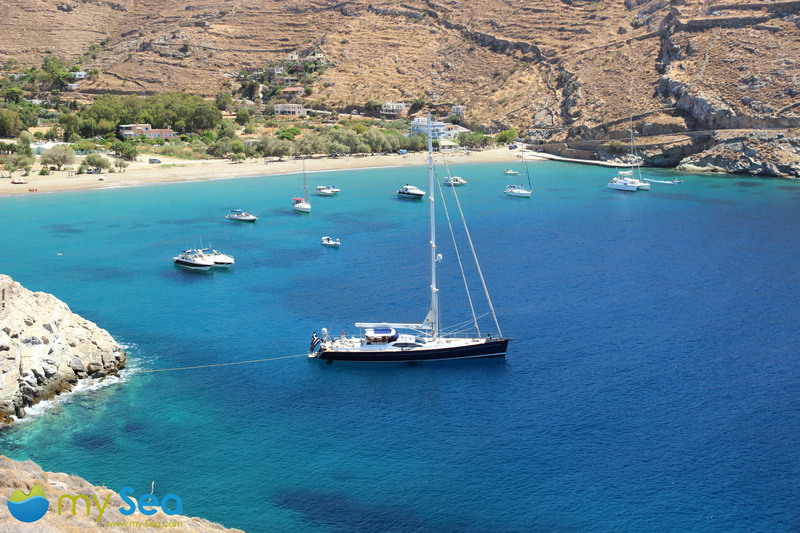 The bay is well-known for the ruins of a temple dedicated to Apollo and Athena. The ruins have been recently restored and rebuilt. 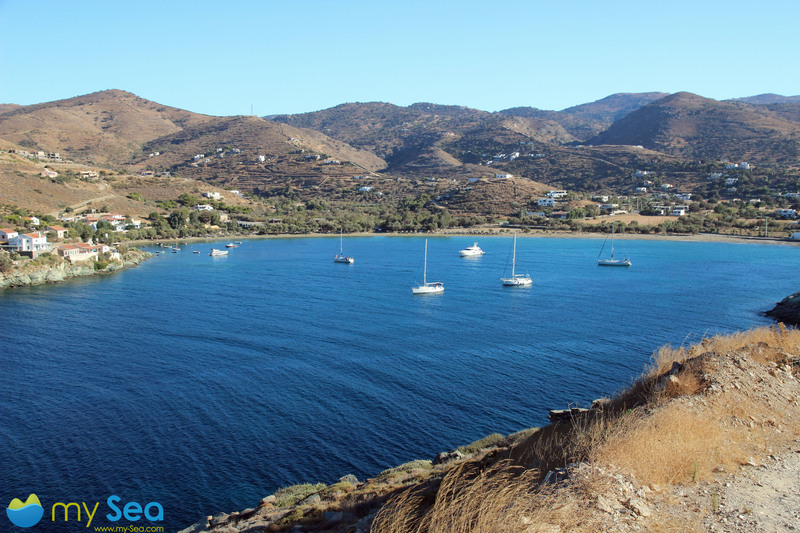 There are more sheltered anchorages on the west coast of Kea. The most well-known is Ormos Kavia near Koundouros. 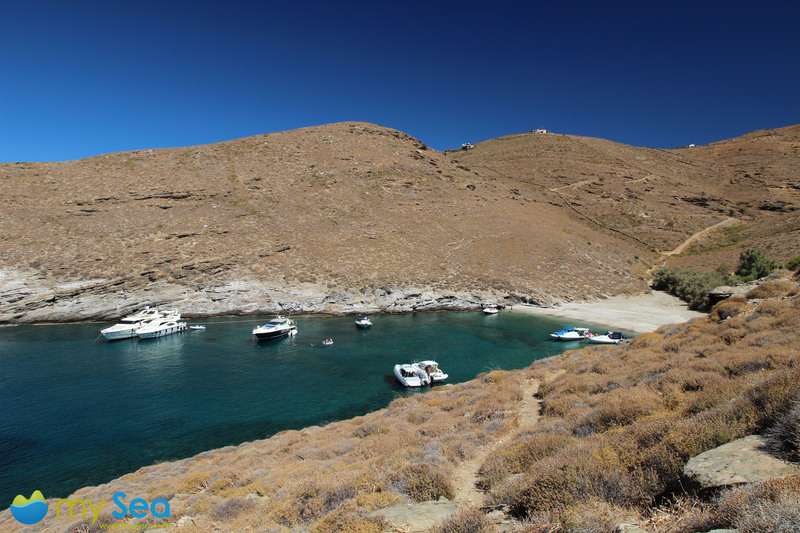 The swimming bay, surrounded by a barren rocky landscape, provides protection from the north winds in summer. When entering the bay, it is necessary to pay attention to the shoal, which is marked on the map and lies far out at sea (and therefore unexpected). In the bay, yachts need to keep enough distance to the waterfront as rock ledges run far into the water from the headland. The calmest anchorages are on the western side if the land lines are run out towards the north. These spots, however, are usually always taken first. St. George´s tavern has been closed since 2011, but the bungalow resort is still operating. There are lovely holiday apartments around the bay, which mainly belong to affluent Athenians. However, the culinary offer is limited. During the day the club-like complex, Porto Koundouros, serves good food, snacks and cocktails. It b orders on Pisses Bay to the north. This green bay is surrounded by an impressive mountain backdrop and lies in the largest valley in Kea where fruit and vegetables are cultivated. The sandy beach, some 400 m long, skirts the waterfront. Although the bay is completely open towards the west and there is often a slight swell, yachts can still moor here overnight. The most secure places are on the northern side with a line towards the shore. Two taverns on land are on hand sh ould visitors decide not to want to cook themselves. Vroskopos is extremely popular, even though mostly unknown. Well-hidden, if coming from inland it can only be reached by a winding beaten path but it is a struggle to get through. This sheltered bay faces north. There is a glorious white beach at the vertex of the bay. The water is crystal clear and is ideal for swimming. If staying overnight, shore lines should be run out towards the north and a lot of chain let out as the bay is quite deep. Many Athenians come to this idyll in the high season and at weekends in their power RIBs and motor yachts.